Secretary of State Rex Tillerson (L) listens as President Donald Trump announces that the United States will designate North Korea a state sponsor of terrorism, during a cabinet meeting at the White House, Nov. 20, 2017, in Washington. The United States is returning North Korea to its list of states sponsoring terrorism after a 10-year absence, a move that will put additional financial and diplomatic pressure on the Pyongyang government. "It should have happened years ago," President Donald Trump said Monday from the White House, calling North Korea a "murderous regime." The U.S. Treasury Department will officially announce the designation and further sanctions on Pyongyang on Tuesday, Trump said. Other countries on the terrorism sponsors list are Iran, Sudan and Syria. "We still hope for diplomacy," Secretary of State Rex Tillerson told White House reporters in a follow-up briefing Monday. But he said there would be no letup in the campaign to constantly ratchet up sanctions until Kim Jong Un relents. "The U.S. is ready to continue to tighten pressure on the Kim regime with the intention to have him understand this is only going to get worse until you're ready to come and talk, " the secretary said. Tillerson noted recent success in persuading other countries in the region to withdraw support from the totalitarian regime. "On our visit to Vietnam, they have committed that they are going to curtail activities further with North Korea," Tillerson said. "Malaysia has indicated a curtailment, Singapore has cut off all trade with North Korea, the Philippines have cut off all trade." 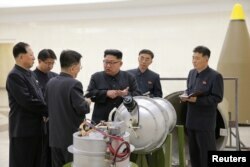 FILE - North Korean leader Kim Jong Un, center, provides guidance on a nuclear weapons development in this undated photo released by North Korea's Korean Central News Agency in Pyongyang, Sept. 3, 2017. The secretary of state said the United States believes current sanctions are having a significant effect, and wondered aloud whether they might be responsible for Pyongyang's apparent halt in nuclear and missile tests. "Is this the reason we haven't had a provocative act in 60 days?" Tillerson said. "I don't want to suggest that I can say, but we're hopeful this period will continue." The U.S. put North Korea on the terror sponsor list in 1988, after North Korean agents blew up a South Korean civilian airliner, killing 115 people. But Pyongyang was removed in 2008 after it met benchmarks related to a nuclear disarmament deal. The six-party disarmament talks collapsed a short time later, and North Korea declared the nuclear deal void. It has since conducted five more nuclear tests and steadily ramped up its ballistic missile program, in violation of U.N. Security Council resolutions. "We took them off that list for some specific issues we were seeking — mainly the destruction of the cooling tower and some disabling steps," said former Ambassador Christopher Hill, who led the U.S. delegation to the six-party nuclear talks. "In the meantime, by all accounts they seem to have the graphite-moderated reactor back in service. So they should be put back on the list." 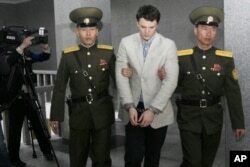 The effort to reinstate North Korea to the terror list intensified after American college student Otto Warmbier died in June, shortly after being released from North Korean custody. Warmbier had been sentenced to 15 years hard labor for the alleged theft of a propaganda poster from his North Korean hotel. FILE - American student Otto Warmbier, center, is escorted at the Supreme Court in Pyongyang, North Korea, March 16, 2016. North Korea's highest court sentenced Warmbier to 15 years in prison after he allegedly attempted to steal a propaganda banner. Released and returned to the U.S. in a semi-comatose state in June, Warmbier died within days. The administration's move won praise from several members of Congress who have urged that North Korea be returned to the list of terrorism sponsors. "Over the past year alone, Kim Jong Un and his regime brazenly assassinated his brother with a chemical weapon and brutally tortured Otto Warmbier, leading directly to his tragic death," said House Foreign Affairs Committee Chairman Ed Royce, a California Republican, in a statement. "These aren't isolated incidents, but are examples of a consistent pattern of terror." While North Korea is widely regarded as one of the most oppressive governments in the world with respect to its own people, its involvement with international terrorism had been less well known. But the label is accurate, says Bruce Klingner, a North Korea specialist at the Heritage Foundation. Specifically, Klingner cites recent cyberattacks against U.S. and South Korean targets, including the 2014 attack against Sony Pictures for producing a film critical of North Korean leader Kim Jong Un. Klingner also mentions multiple North Korean assassinations and assassination plots, including the killing of Kim Jong Nam, Kim's half brother, who was poisoned earlier this year at a Malaysian airport. 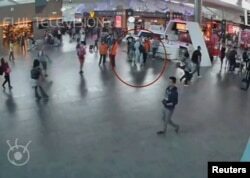 A still image from a CCTV footage appears to show a man purported to be Kim Jong Nam (circled in red) talking to airport staff, after being accosted by a woman in a white shirt, at Kuala Lumpur International Airport in Malaysia, Feb. 13, 2017. Kim later died of poisoning. "While global attention has been on nuclear weapons and missiles, we must not lose sight of North Korea's terrorist acts and gross violations of human rights," Klingner said. VOA's William Gallo and Nike Ching contributed to this report.